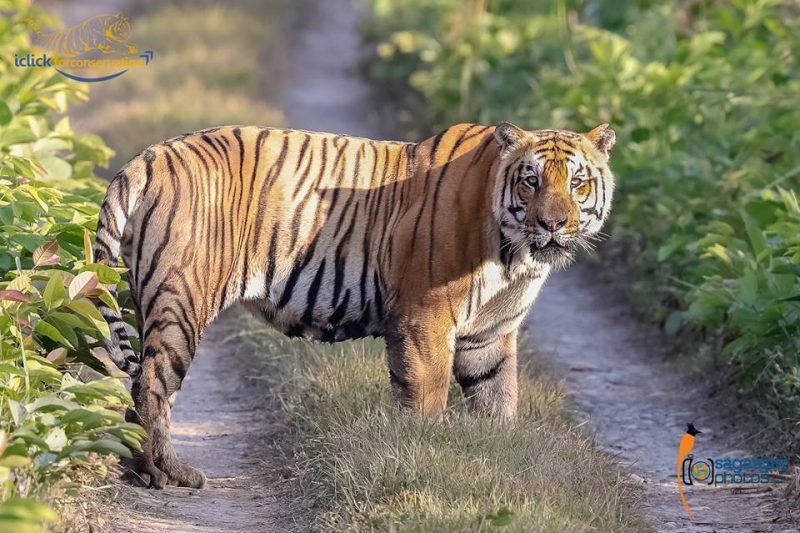 A Bengal tiger stares back in Nepal's Bardia National Park. Image by Sagar Giri. Used with permission. Conservationists are upbeat about Nepal slated to become the first country to double its wild tiger numbers by 2022. On National Conservation Day, September 23, 2018, Nepal announced that it has 235 tigers living in the wild. In 2009, there were only 121 tigers in Nepal. In 2010, at the Tiger Summit in St. Petersburg, Russia, the Government of Nepal along with the governments of India, Russia, Nepal, and Bhutan pledged to double the number of tigers by 2022. Tigers are difficult to track because of their elusive nature. According to noted tiger expert Dr. K. Ullas Karanth, in the 1960s, officials in India, Nepal, Bangladesh, and Russia assumed that just as human fingerprints are unique, paws of a tiger must differ. They thought they could count tigers by counting their tracks, but the method was flawed. Nepal has also signed a memorandum of understanding with China for biodiversity conservation focused on curbing illicit wildlife trade, including tiger parts. Nepal’s declaration of Banke National Park as a protected area has also provided larger territory for the tigers. Estimating the abundance of tigers and its prey base (the availability of food in any given habitat to support a predator) will help assess the effectiveness of conservation interventions and formulate plans for future management. For now, Nepali tiger experts are optimistic about Nepal doubling its tiger numbers by 2022. It just needs 15 more tigers to reach its goal in the next four years! Tiger experts have said that Nepal is on the track to reach its target of increasing the tiger numbers to 250 in four years.